Hines has been supplying produce since 1936 and we are here to tell you, you should expect more from your produce supplier than just a competitive price. Many other factors come into play, such as quality, food safety, and availability just to name a few. 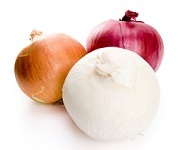 When you rely on Hines Produce for your Onion needs, competitive pricing is a given. But you'll also gain value and service that create efficiencies and deliver a consumer benefit well beyond today's bottom line. With close to a century of produce experience, you can trust Hines to build solutions that fit every need, including the most important one—the delivery of fresh, quality produce into your consumers' hands. To contact our produce department click here.